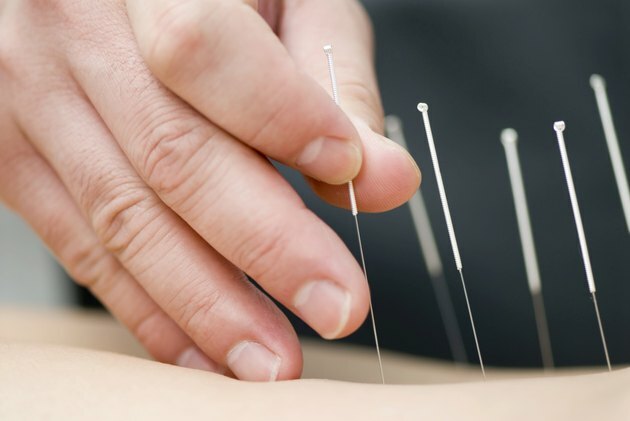 The acupuncture points used to treat dizziness differ from patient to patient, depending on the practitioner’s assessment of the underlying causes of the symptoms. Two common points that are used to treat dizziness and imbalance are “LV 3” and “ST 9.” "LV 3," known as the Great Surge, or Tai Chong in Chinese, is located on the top of the foot. It is a calming point, according to Yin Yang House, and is used to treat a range of symptoms including anxiety, headaches and chest pain. "ST 9" is also known as “Man’s Prognosis” or “Ren Ying.” Found near the Adam’s apple, it is also used to treat headaches, asthma and hiccups.